4 organic chicken breasts, trimmed of fat. While you can cook this recipe with less, it’s better to make up extra as a replacement to unhealthy processed meat. Organic chicken is also far better if you can get it as it has a superior nutritional profile and avoids the antibiotics issue. 2 – 4 cloves of garlic (depending on how much you like it), crushed. Garlic is an exceptionally healthy herb with natural antifungal, antibacterial and antiviral properties. It also has cardiovascular benefits, fights cancer and boost your immunity. A small piece of ginger (around half an inch for a lighter taste or a full inch for those that like their ginger), finely chopped. Ginger contains phenolic compounds that improved digestion and is a powerful anti-inflammatory within your body. One small hot red chili, deseeded and finely chopped. The capsaicin in chilies regulates blood sugar and boost circulation for improved cardiovascular health. They also increase your metabolic rate to help improve your body’s fat burning potential. Make sure you wash your hands well with dishwashing liquid, lemon juice or vinegar straight after handling chilies. 2 tablespoons of coldpressed avocado oil. Avocado oil is rich in monounsaturated fats and very heat stable for cooking with. It’s the best cooking oil to have in your kitchen and far superior to inflammatory processed vegetable oils. The lower grade ‘light’varieties of olive oil could also be used, but extra-virgin olive oil is unstable when heated and best not used in high-temperature cooking like this. The juice of half a fresh lemon. Lemons are full of vitamin C and antioxidant flavonoids. They also stimulate gastric juices and have a cleansing effect on your entire digestive system. 1 teaspoon of turmeric, preferably high curcumin. Turmeric is a potent cancer fighter and worth adding to any meal you can. It will also turn your chicken breasts an interesting shade of orange that looks great on the dinner plate. To begin, trim your organic chicken breasts of fat and, using a sharp knife, score them about half a dozen times with shallow slices horizontally. This helps the marinade to soak into the chicken. Find a baking dish that will preferably just fit your chicken breasts. Larger baking dishes won’t allow as much of the marinade to cover the chicken so ones that they fit closely together in are better. Pour your avocado oil directly into the baking dish first and then stir in the garlic, ginger, chili, turmeric and lemon juice until it’s all well mixed. Add the scored chicken breasts and flip to coat both sides with the marinade. Cover and put into the fridge for at least an hour. Ideally, turn them after the first hour and let them marinate for another hour. When you’re ready to cook your chicken, take them out of the fridge and put them into the oven at 350 degrees Fahrenheit for around 15 minutes. Turn each of them then and cook for a further 10 minutes. Check that they are done by carefully slicing into the thickest part of the biggest one and making sure that the center is white and not pink. Larger chicken breasts may take a little longer so it’s a good idea to check them in this way. My favorite way to have these marinated garlic, ginger and chili chicken breasts is to serve them with steamed veggies and pour the remaining marinade right over the top of the vegetables as well. You can make up fresh salad and slice the warm chicken over it and drizzle it with the marinade for a dressing. Because the flavor is so powerful, this marinated chili chicken makes a great replacement for very unhealthy processed meat products like salami and pepperoni. It also goes really well with a side serving of nutritious wild rice or mixed into high protein quinoa pasta dishes. Any extra chicken breasts you can keep in the fridge for a few days and slice them up wherever you used to have unhealthy sandwich meats with dangerous sodium nitrite. It’s a simple change for better health that actually taste much better as well. 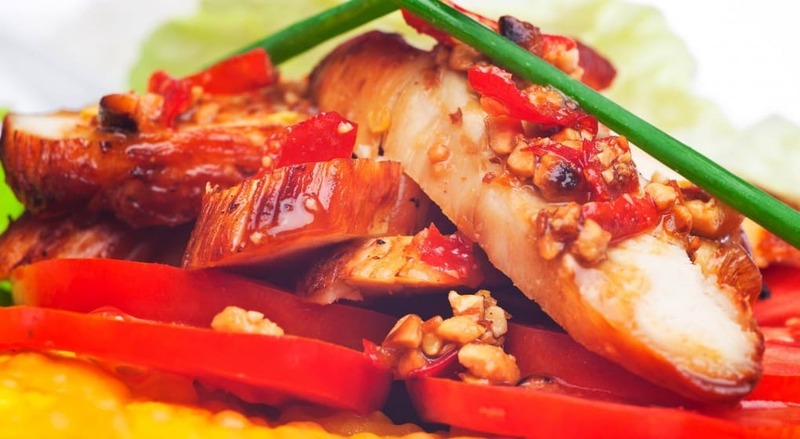 I hope you enjoy this garlic, ginger and chili chicken recipe. Let me know what you think of it if you make it for yourself and any extra ingredients you’d suggest adding to it.